Whether you are buying or selling a property, it can be hard to wrap your head around conveyancing costs. Conveyancing is the process of transferring legal title of property from one person to another. It involves a broad range of steps, and it's worth thinking carefully about so you know you're getting the best bang for your buck. Conveyancing can be done through a licensed conveyancer or a conveyancing lawyer. Alternatively, it can be done through a DIY kit, although these provide only guidance material and aren't recommended unless you're conversant with property law. If you choose to use a licensed conveyancer or a conveyancing lawyer, you will quickly learn that there are no set fees for conveyancing. This is because not all property transactions are the same. It is therefore vital to have a list of questions in mind to identify if a conveyancing specialist is suitable for you. Did you know online conveyancing offers a faster turnaround time than conventional conveyancing? Contact Conveyancing.com today to receive an instant quote. The main thing to keep in mind when comparing conveyancing costs is what scope of work your conveyancer is providing to you. When it comes to exchanging ownership in property, the lowest price doesn't always reflect the best service. 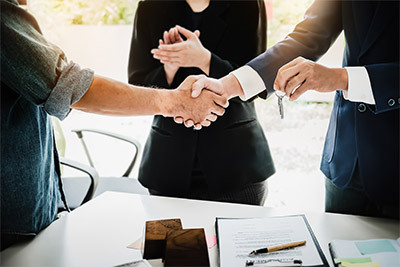 If you engage a cheap conveyancer, you may find that they 're less likely to do enough to protect you as a buyer or seller, and less equipped to handle contract negotiations. Cheaper conveyancing costs generally convey greater risks involved, so focus on achieving value for money instead of a bargain rate. Conveyancers must hold an appropriate license to do your conveyancing work, and they should also have a trained eye for spotting unusual terms that pose a risk to you. Costs can vary considerably between licensed conveyancers and conveyancing lawyers. When you request a quote from either, keep in mind that in addition to the service fee, you'll also need to pay 'disbursements', which indicate costs incurred through third parties. Generally, both services will provide a ‘cost range‘ for disbursements in their quotes. It's a wise idea to ask for a breakdown of all likely costs before you choose any conveyancer to work for you. Getting a detailed breakdown of costs can make it easier to compare conveyancing costs from different services as well as help you determine which one provides the best value overall. Experience: It is vital that your conveyancer can deliver the right advice for a diverse range of circumstances. Protection: Always check what protection a conveyancer has to offer you in case something goes wrong. 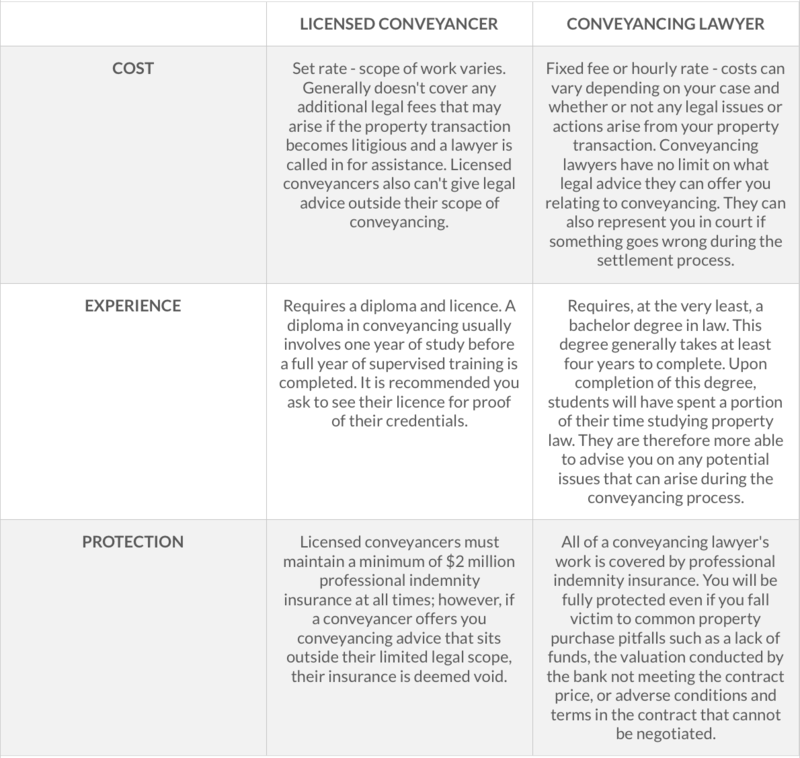 The table below may give you a better idea of what a licensed conveyancer can offer you versus a conveyancing lawyer. 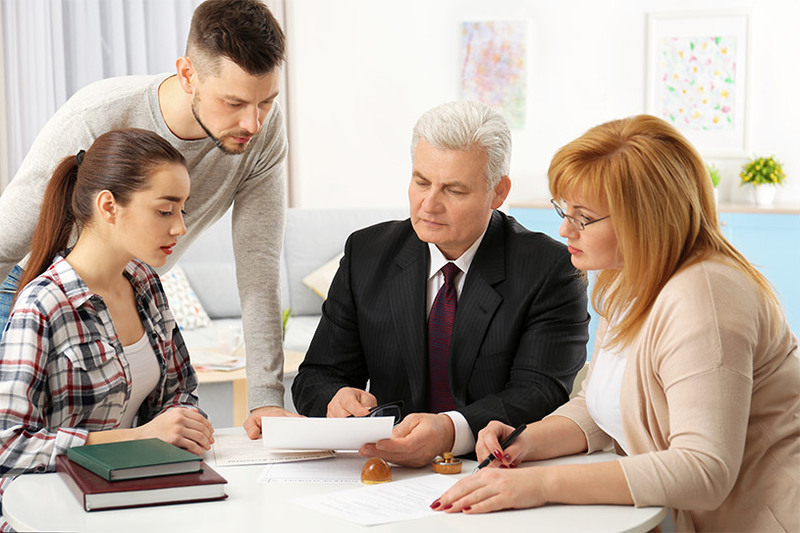 As you can see, conveyancing lawyers are usually regarded as the safer option because they have no limits on the legal advice they can provide you and their indemnity insurance fully covers you. They will generally have a more comprehensive and nuanced understanding of property laws, which is a clear advantage if the sale goes wrong. Reputation: Take the time to see what other people are saying about your potential conveyancer. Do they attract a particular type of customer? Turnaround time: We're all time-strapped in today's world, and finding a conveyancer who can get the job done fast will save you a lot of stress and heartache. There is a lot to think about when buying and selling property, and while the costs you incur are a big consideration, there are some risks that aren't worth taking. Research a conveyancer before signing anything, ensure their costs include all contingencies and fees/charges and choose one who you feel confident can steer you around any legal pitfalls you may encounter. Value for money should be your primary concern, rather than cheapness of service. At Conveyancing.com, we have a team of 12 dedicated conveyancing lawyers with extensive experience in property law and online conveyancing. We can ensure that documents for your Section 52 are prepared accurately within a small timeframe and guarantee real-time tracking of the status of document reviews. We are happy to provide detailed breakdowns of all conveyancing costs and talk you through the various factors that can influence the conditions of a settlement. 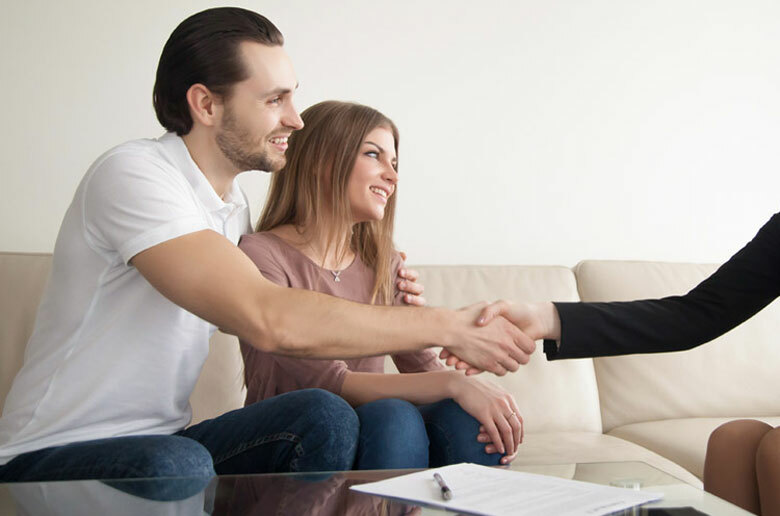 Buying or selling a property is one of the most significant life decisions you can make, so shop around, compare costs and see which type of conveyancer is the best fit for you. A careless choice can lead to surprises on settlement, so choose wisely. Contact us at Conveyancing.com today to chat with one of our in-house conveyancing lawyers. Learn about the benefits of Online Conveyancing and see if it's right for you.